This entry was posted in Homeowners Insurance on 11/21/2017 by Alejandra Vazquez. 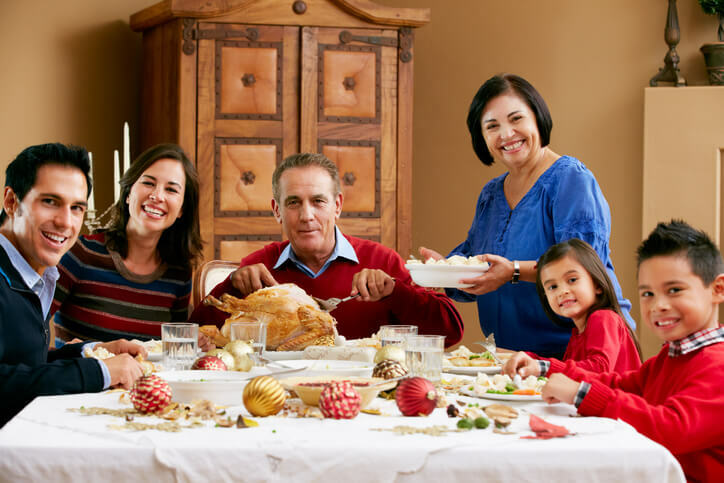 The holiday season should be a time of joy and jubilation, but it also brings along plenty of stress for most people. November launches the time to start to compare health insurance options. Traveling to see your family leaves you at risk for burglary, while hosting your guests can damage your home or leave you liable for an accident. Protect your home and family while enjoying the holiday season with these seven tips. Don’t post about your plans to get away, or even spend the day shopping for gifts, on your social media accounts. You’d be shocked at what burglars and other criminals can find out about you and use against you to plan a crime. Stick to sharing those great home insurance quotes you found and turn off any automatic geo-tagging services your social platforms may use. Avoid running power cords for holiday lights and outdoor decorations through windows and doors. These cords leave the window or door open just a bit, creating a gap for criminals to wedge their way in. Keep up an affordable renters insurance plan or make sure your homeowner’s insurance is up to date. You definitely want a full replacement of your belongings if you’re a victim of a burglary during the holidays. Check your tree’s water level at least twice a day, every day. A live tree can run out of water within a matter of hours and dry out to the point where even small holiday lights can start a serious house fire. Stick with faux trees if you plan to be away for more than a few days and don’t have someone to water the tree. Swap the traditional candles for battery powered ones. At the very least, make sure all candles are kept at least 6 feet away from flammable materials like wreaths and curtains, and avoid large candles with multiple wicks since they can pull up too much wax and start burning out of control. A supplemental fire insurance plan doesn’t hurt, either. If you host a party and serve alcohol or even allow guests to bring their own, don’t let them drive while inebriated. Even though almost all homeowner’s policies include some amount of general liability insurance, you can still be held responsible for a drunk driver’s accident. Finally, have your roof inspected before the first snow or ice of the season arrives. A very minor shingle or slope problem can lead to serious and expensive damage if the weight of the snow causes a collapse. If you’re living in a rental or landlord house, ask them to perform or cover the inspection cost. Take the time to compare health insurance plans, homeowners insurance plans, or choose next year’s umbrella insurance before the holidays arrive. Give us a call today at 800-777-5620 to discuss your health, renters, and homeowners insurance needs, and get a free quote from Freeway Insurance.